I’ve been shunning exact measurements recently. With all that’s going on in the world, I seem to find refuge in the simple flow of following ingredients into their recipe – I say “their recipe” because I’ve just been letting them take over. Maybe this is a bit off the wall, but I almost feel like a writer when I’m cooking, and my vegetables are my characters. Any novelist will tell you the characters they create eventually take over the story, lead it wherever they please. I feel like cooking is exactly the same. Yes, I usually rely on recipes (at least to start with) when I attempt baking – I imagine this particular arena filled with a basket of already-tried and tested proofs that are hard for me to compete with. Anything else, though, is fair game and the ingredients (from what just happens to be in the fridge, to what just happens to jump into the pot) dictate. For me, cooking has two personalities: no stress or completely chaotic. Watch “Top Chef” (the current Monday night favorite chez nous) to witness an example of the latter. Come into our kitchen on a late (preferably sunny) Monday afternoon for the other side of the spectrum, when I let go of the first day of the workweek by creating my “zen zone.” Thanks to vegetable soup, cooking is like yoga – with wooden spoons. I just finished making a huge pot of my “soupe de grandmère” and feel like I’ve just done deep breathing and warrior pose. Unlike my marathon weekends when I plunge into crazy, time-consuming and ambitious culinary adventures (and we don’t eat until 9 or 10 o’clock! ), late weekday afternoons are often reserved for kitchen Bikram. 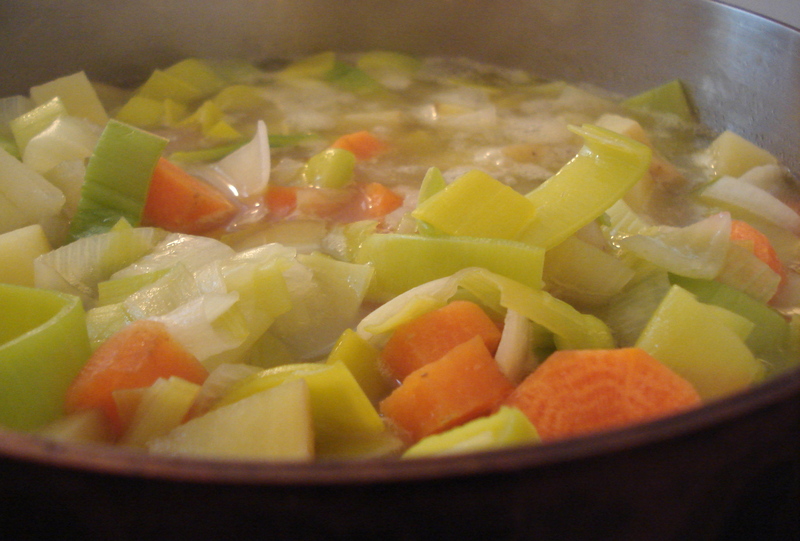 For my vegetable soup, I usually sauté some onions, garlics and leeks in olive oil. Then I add potatoes, carrot… even corn and white beans when I have them. I cover it all with water, add a couple bay leaves and some salt, and let boil until all the vegetables are cooked. A warm, comforting aroma spreads through the apartment (and the outside hallway and elevator) as it simmers. Like today, I often prepare it early, turn off the burner and reheat the soup when it’s dinner time. All in all, the preparation takes about 20 minutes (chopping veggies) and the cooking a minimum of 45 minutes – longer simmering simply brings out more flavor. This entry was posted in Recipes (All), Recipes (Gluten-free), Recipes (Vegan) and tagged soups, vegetables. Bookmark the permalink.